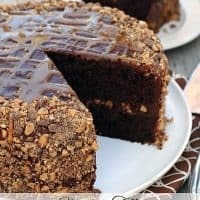 CHOCOLATE CARAMEL TOFFEE CAKE — A chocolate ganache and toffee filling is sandwiched between layers of rich, moist chocolate cake, which is frosted with more chocolate ganache and garnished with toffee bits and caramel. Chocolate. Caramel. Toffee. Cake. 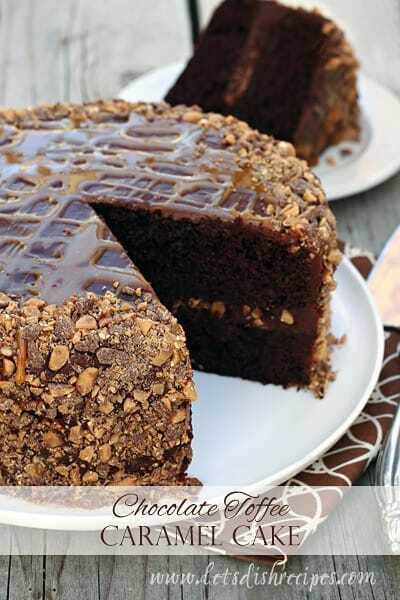 That’s pretty much all you need to know about this amazing Chocolate Caramel Toffee Cake! Rich chocolate ganache and tasty toffee bits are sandwiched in between two moist chocolate cake layers, then everything is finished off with more toffee and ganache, plus a drizzle of caramel for good measure. This is one cake will definitely impress your family and friends! And no one has to know you used a cake mix as a shortcut. This cake is great if you want to bake up a weekend dessert, but it’s decadent enough for a special occasion. You won’t regret giving this recipe a try! 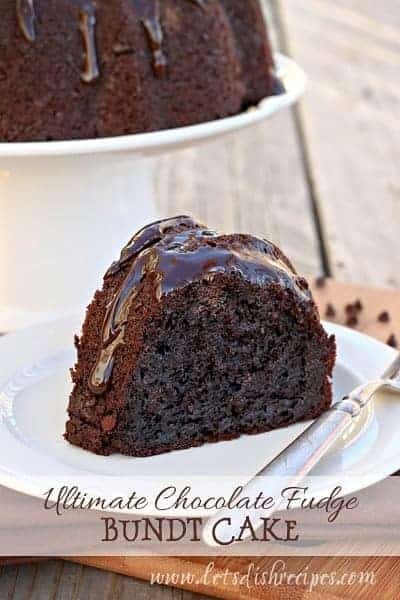 A chocolate ganache and toffee filling is sandwiched between layers of rich, moist chocolate cake, which is frosted with more chocolate ganache and garnished with toffee bits and caramel. With an electric mixer, beat ingredients for cake until smooth. Divide between the prepared pans. Bake for about 25 minutes, or until a toothpick inserted in the center comes out clean. Cool for 10-15 minutes before turning out onto a wire rack to cool completely. Meanwhile, prepare the ganache by placing the chocolate in a large bowl. Heat the cream in a medium saucepan until it just begins to simmer. Do not let it boil. Pour the cream over the chocolate and let stand for 2-3 minutes. Whisk the chocolate and cream until the chocolate is melted and smooth. Remove 1 1/2 cups of ganache to a separate bowl and refrigerate. Place one cake layer on a plate or platter. Spread remaining ganache over top. 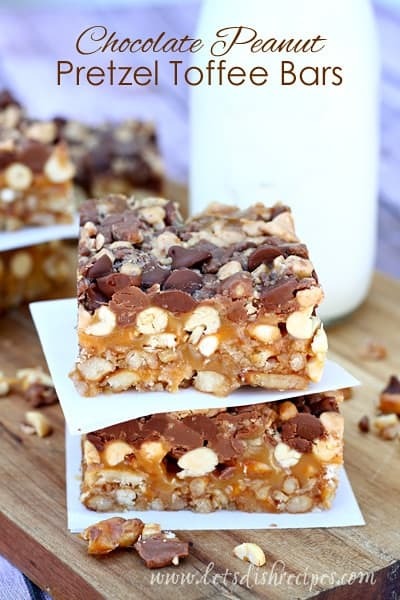 Sprinkle with 1/2 cup toffee bits. Let stand for about 5 minutes. Place the remaining cake layer over the first. Use the refrigerated ganache to frost the top and sides of the cake. Drizzle the caramel sauce over the top of the cake. Press the remaining toffee bits around the sides of the cake. Slice and serve. Who Dished It Up First: Adapted from Back Around the Table. Love that recipe! What size of pan did you use? I used 2 9-inch round pans. Did you use 9 inch round pans that are 2 or 3 inches tall? You can use either. The layers will be the same height regardless. Please help me, in this recipe you talk about caramel sauce, but there is no recipe for this sauce. You use prepared caramel sauce like you buy in a jar. It honestly depends on how big the slices are, which is why I don’t say in the recipe, but I’d say 12 at the minimum. You add all the cake ingredients into a mixing bowl at once.